While the high winds continued today in the desert, the class went on and Mark continued to help us focus on his tonal method. He starts by blocking in a single, middle value for each plane in the landscape (sky, ground, slanted, upright). 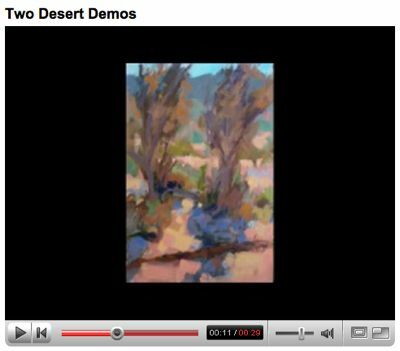 Here’s a quick video that shows two of my studies today in the drawing stage to the completed study. I stayed hunkered in the shelter of the windbreak formed by my car for this next study, cliffs in shadow. I tried to keep in simple, again focusing on separation of planes of light. The winds grew too strong by the afternoon, so we moved to the shelter of a nearby grove of palms. 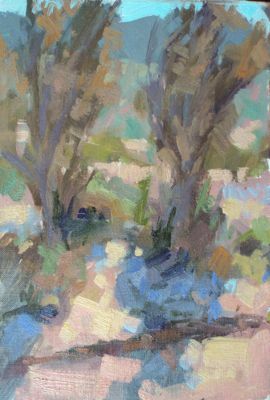 Did two studies here, both from a nice sheltered spot. I’m happy with the brush strokes and overall composition. 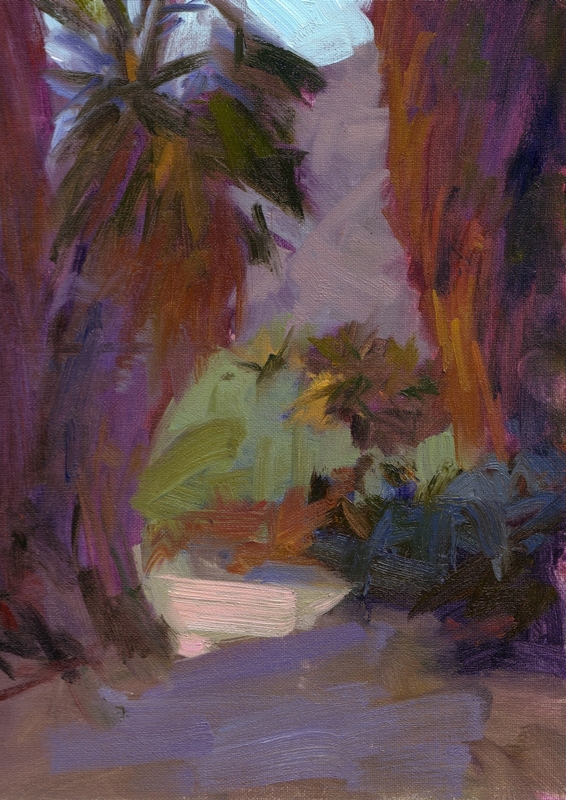 My spot in the palm grove was relatively sheltered, so I turned right and painted another scene through the palms, this time focusing on the distant hills, which were beautifully lit. 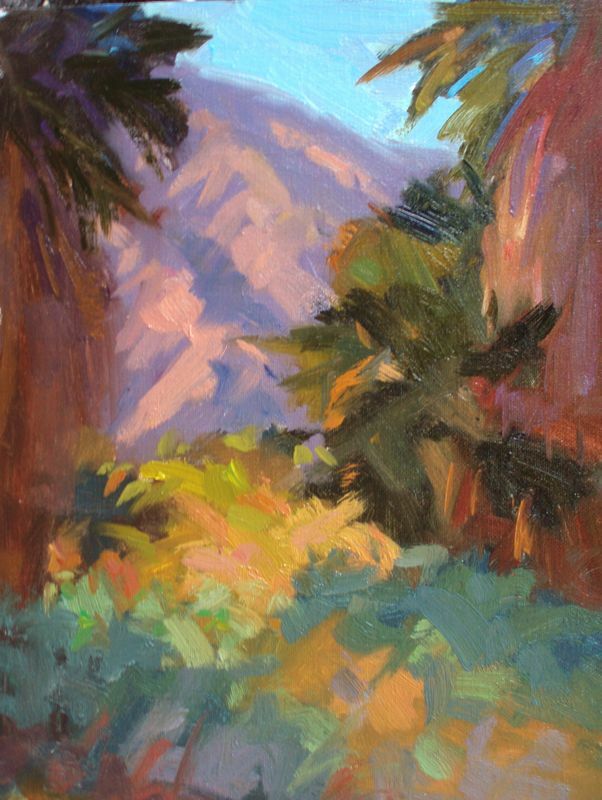 After completing back-to-back workshops, one with a colorist, the other a tonalist, I have some thoughts on the difference between two. Whereas a colorist (at least as practiced by Camille Przewodek) will start with very high-key, intense underpaintings and then tone it down with local color to finish; tonalists focus on values, often starting with neutral underpaintings, and then gradually brining up the color to finish. Each technique has it’s uses. 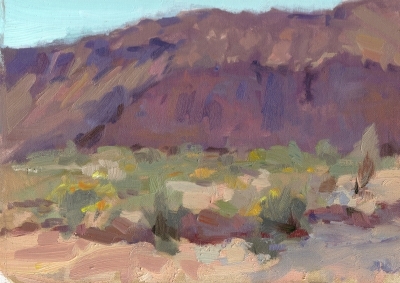 My thought right now is the tonalist approach is best for paintings that are more quiet, calm lighting, etc, whereas colorist approaches might be best for full-sun, colorful subjects. This is probably over-simplifying, but I’m going with this theory for now.